Every once in a while, an amazing band pops up out of nowhere and we think to ourselves, “How have we not been hearing about this band for ages?” These bands tend to produce a sound that is much more mature than the years that the band has actually been in existence. One such act is Motopony, fronted by Daniel Blue of Tacoma. He hasn’t been a musician for long, however his music consists of smoothly constructed, bluesy pop songs. By being catchy without being cheesy and relying heavily on Blue’s own one-of-a-kind vocals, we became immediate fans. Record label tinyOGRE was apparently also infatuated, since they signed Motopony earlier this month. 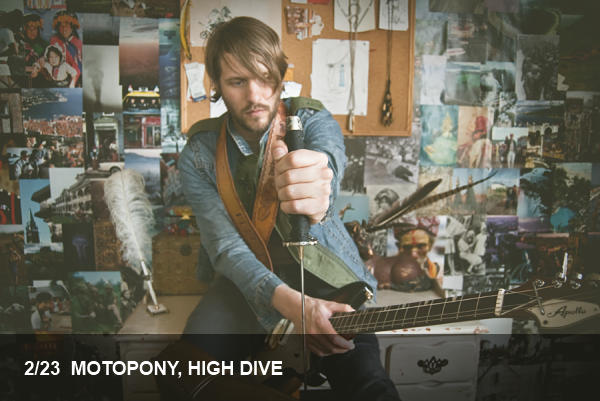 Motopony is headlining at the High Dive tonight, supported by The Directory and Zach Fleury – the perfect Wednesday night lineup if you ask us.